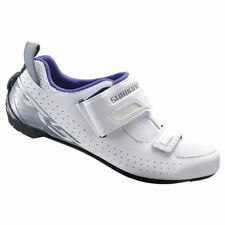 You are bidding on a pair of SHIMANO PEDALING DYNAMICS OFF SET BIKE SHOES SIZE 43. THEY ARE USED BUT STILL IN GOOD CONDITION No returns and payment through paypal. Will post within 4 working days of payment. PLEASE LOOK AT MY OTHER ITEMS. I WILL COMBINE POSTAGE. ITEMS LISTED EVERY WEEKEND , KEEP AN EYE OUT FOR A BARGAIN !!!!!! Pearl Izumi Tri Fly lV New in box. Superb cycling shoes, from a non-smoking home. 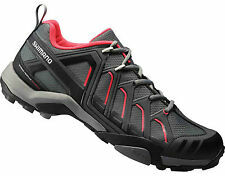 Shimano Spinning Shoes. Condition is Used. With cleats . Size 41. Used but in good condition. Dispatched with Royal Mail 2nd Class. 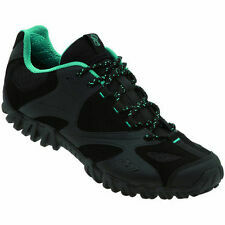 Ladies Northwave Cycling Shoes. Size 40/6.5. These fine shoes boast carbon-reinforced soles so every watt of your precious power goes into forward motion. BNIB Five Ten Freerider cycling shoes, size 5.5. £7.00 2-10kg. £4.50 1-2 kg. Shoes are new, never used. 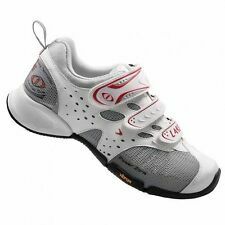 It combines cycling-specific features like clipless pedal compatibility and supportive fit with the walkability of a grippy Vibram outsole and the comfort of a light hiking shoe. • Vibram Ecostep rubber outsole. Used condition, marking to bottom. Precision fit: Ensures a snug fit without binding or crowding it. Adjustable arch support: For stability and comfort. Over £200 when new! Size EU 37 = UK 3. Anatomical toe cap with air intake. Lightweight fiberglass-reinforced sole gives a direct connection to the pedals for increased power output while the synthetic leather upper enhances strength and stability. Best matched with Shimano PD-R550, PD-R540, PD-540-LA, PD-A520 Pedals. Specialized Zante Rd Wmn White and Light Turquoise 39EU 8USA 5.5UK. Condition is New with box. Dispatched with Other Courier (3 to 5 days). I believe the shoes / box date from the late seventies. Shoes are new in the original box, never used. Durable compression-molded EVA midsole with mid-flex plate. Stealth® S1™ outsole for proven grip and long life. 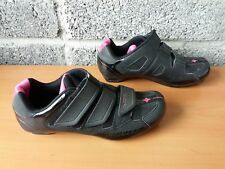 ***SPECIALIZED ZANTE ROAD CYCLE SHOES_WOMENS_UK SIZE 4***. Condition is Used. Dispatched with Royal Mail 2nd Class. Excellent condition, true to size. Really easy fastening - great for triathlons.